Spectacular shiny Copper pendulum. Copper is an excellent energy conductor and channeling tool as it stimulates electricity and mystical subtle energies from the higher planes. 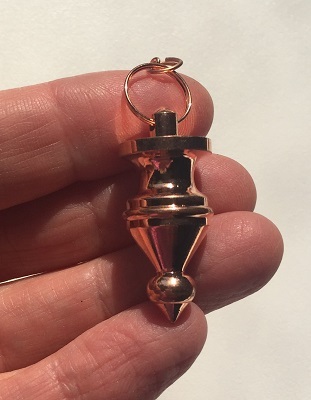 A copper pendulum is a wonderful divination tool that would be helpful in bringing information from the subconscious to conscious awareness. 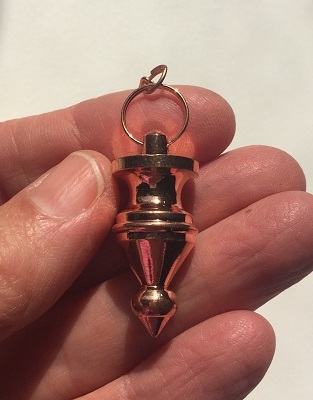 A copper pendulum may be used as a tool to gain insight by asking specific questions. Copper is said to enhance thoughts and healing energies. Copper stimulates initiative and experimentation, optimism, diplomacy, and independence. 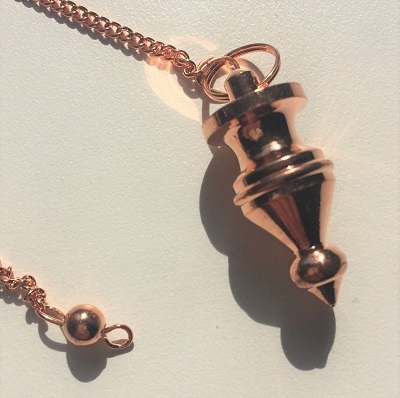 Copper pendulums may be helpful in energy work, as they indicate any blockages in the chakras and the energetic flow of the meridian channels. Copper combats feelings of lethargy, restlessness, anxiety, depression, and non-acceptance of oneself through supportive energetic vibrations while helping with the release of self-imposed restrictions. 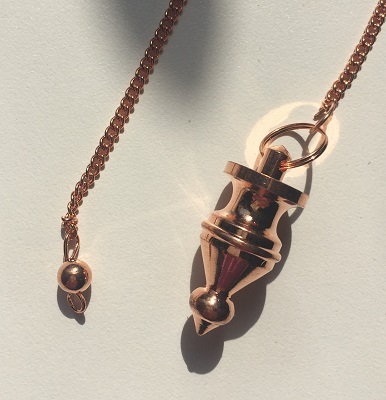 In healing, copper pendulums may be used in making healthy choices and additional clarity with diagnosis. Copper maybe helpful in the formation of tissues and repair to the physical body after injury or trauma. Copper may be helpful in the treatment of arthritis and to help ameliorate the pain of broken bones. Copper may be helpful in strengthening the delivery of oxygen to the blood and throughout the respiratory system. Copper may be helpful for women and the female reproductive system.